Forget about ordinary dog collars! 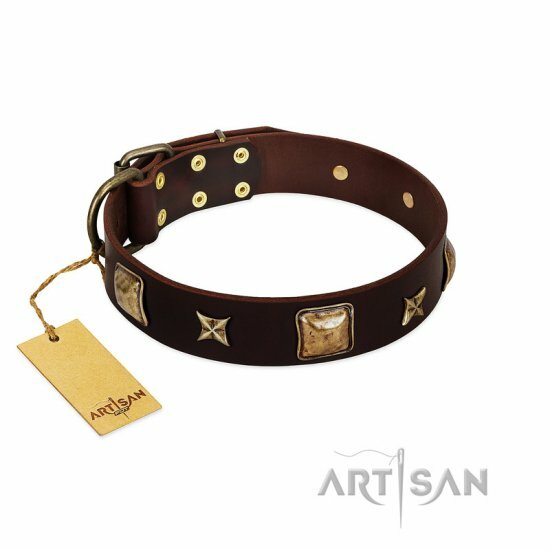 Our light tan leather dog collar with old-bronze like squares and stars looks like a luxury dog accessory and it will underline your dog’s style and individuality! Made of selected full grain leather and reliable brass hardware, a chic natural leather dog collar will please you for ages. A welded D-ring allows attaching a dog leash for better control of your canine. The edges of a natural light dog collar are rounded and polished in order to prevent a dog’s skin from cutting, rubbing or irritation. 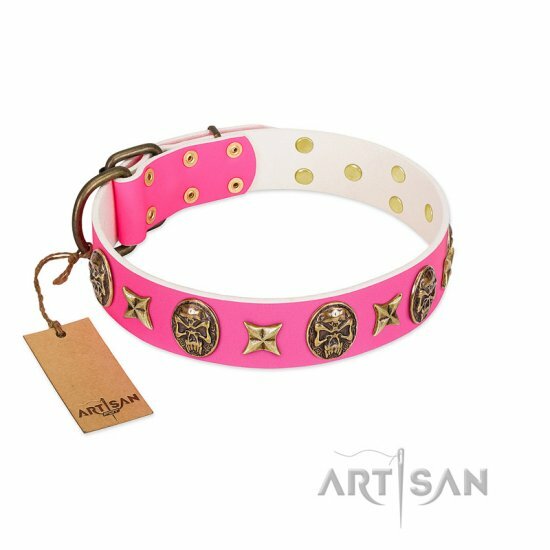 A fancy tan leather studded dog collar FDT Artisan has extra durability due to a wide leather strap and a strong traditional buckle. It will stand huge pulling loads of strong dog breeds. Fordogtrainers use only eco-friendly materials, they care about your pet’s comfort walking and training. Hurry up to order a nice light tan leather dog collar at the affordable price with the opportunity to get an ID-tag pendant for free! An adjustable belt buckle allows to put a leather dog collar in a few seconds. Strong and flexible leather ensures optimal comfort during walking. Extraordinary design with squares and decorative brass stars. Rustproof brass hardware of a leather dog collar allow to wear it for a long period of time. Light tan leather dog collar with brass studs looks very stylish and elegant. Brass squares and stars have a fantastic look on a genuine brown leather. This gold and black leather dog collar is handmade with love and care for your dog.